Hatari Lodge is situated in a malaria-free altitude, above 5,.000 ft, on the northern edge of Arusha National Park, with its unspoiled views of lakes and craters, its magical rain forests, and the 4,566 metre high dormant volcano Mount Meru, which rises elegantly in the background. At the very heart of this “luxury bush hotel”, managed by Marlies, Jörg and their staff, are the traditional farm buildings, which were used by the legendary actor Hardy Krüger, and his former manager, Jim Mallory. Views from the Hatari terrace and the walkway out onto the seasonal Momella swamp frame all these wonders and spectacles. The lodge is named after the Hollywood film, 'Hatari!' (meaning 'danger' in Swahili), starring John Wayne and his German co-star Hardy Krüger and fimed in this area in 1960. In Willy's Jeeps and Chevcrolet trucks, the pair raced over the savannah catching rhinos, giraffes and other large mammals, all destined for zoos around the world, portraying an era when capturing wild animals was still big business amongst the tough heroes in Africa. The many months of filming 'Hatari' interrupted Hardy Krüger's new and promising Hollywood career and, as Africa got into his blood, he decided he didn't want to leave. Every free day was spent searching between Mount Kilimanjaro and the Serengeti for a suitable home. A farm known as 'Momella', which he had seen during the filming of 'Hatari' captured his heart. Today his former home and that of manager Jim Mallory form part of Hatari Lodge. Hatari Lodge consists of three buildings, beautifully situated in acacia woodland with breathtaking views onto the Momela swamp, rich with wildlife, and across to the majestic Kilimanjaro. The quite unique “Hatari-Lodge” offers 9 extremely comfortably furnished rooms, each with an open fireplace and a spacious bathroom en suite. Each room has been lovingly decorated by Marlies in a retro style, evoking the 60’s and 70’s - the time of "Hatari!" and the beginning of safaris in Tanzania. The oldest building serves as a large central living and dining room where guests will enjoy Claudia's and Johnny's delicious home-cooked cuisine. Sitting around the open fireplace, which Krüger and Mallory enjoyed so much guests are entertained with information and stories about the flora, fauna and history of Arusha National Park. Here you will find a cosy lounge area and a long bar, which may be accessed from both inside and outside, as well as a small, but fascinating library. The breakfast terrace, bordered by sweet smelling acacias, as well as the viewing platform onto the Momella swamps, offers impressive views of Mt. Meru, Kilimanjaro and the wildlife from close by. Here you enjoy classic sunsets over the snows of Kilimanjaro. Directly below the terrace lies the Momela clearing, which may also be reached via a boardwalk. A viewing platform offers the opportunity to watch animals from close proximity and to enjoy sundowners with Mount Kilimanjaro or Mount Meru in the background. Every day buffalo and waterbuck feed here, warthogs dig for roots or 'mow' the lawn, and numerous giraffe come to visit at the doors of the lodge. Depending on the season, elephants are welcome guests as well. Explore the "Little Serengeti" plains in the south, walk to stunning gorges and waterfalls in the north, enjoy the tropical mountain rainforests, experience the diverse fauna and flora along the Momella Lakes with its rich flamingo population and discover the secret haven of the hidden Ngurdoto Crater - nick-named "little Ngorongoro" due to its stunning beauty and rich wildlife. All these highlights are towered by the shining glaciers of Kilimanjaro and the horseshoe-like cliffs and the peak of Mt. Meru – occasionally covered with snow. Arusha National Park is undoubtedly one of the most beautiful destinations in the country. A variety of half or full-day activities can be arranged to suit the preference of each individual guest to Hatari Lodge, due to its location at Arusha National Park and near to the northern savannah and dry plains of the western Kilimanjaro area that borders Kenya’s Amboseli reserve. The “African Experience” can be enjoyed in many different ways: Close encounters with wildlife on game drives or the experience of the rich and diverse flora and fauna on a guided walk, an adventurous canoe trip, or simply let the resident buffalo, giraffe and other animals come to you as you relax on Hataris' game viewing platform.  Early morning game drive in the National Park to Ngurdoto Crater reaching Buffalo Viewpoint. Excellent view over and into Ngurdoto Crater and the sunlit volcanic walls of Mt Meru. Watch Colobus and Sykes monkeys waking up on their favourite resting branches and look down onto herds of buffalo, giraffe, and warthog as well the occasional elephant. For the active: Walk along crater rim to the northern side with great views to Kilimanjaro. After a late picnic breakfast at Leitong Viewpoint return via "Little Serengeti" to Hatari Lodge for lunch!  Morning game drive through this real “ Lord of the Rings” forest to the crater of Mt Meru, followed by a gentle 2 - 3 hour walk to waterfalls and great viewing spots for bird watching. Picnic brunch with great views over the forests, lakes and Kilimanjaro in the distance. Descend by 4 x 4 or for the active walk along Meru´s northern ridge back to Hatari Lodge.  Afternoon game drive to the Momella Lakes, viewing flamingos and other wetland bird species. Canoeing on Little Momella Lakes with close encounters of wildlife like hippo, buffalo and waterbuck. Sundowners under the roof of Africa - Kilimanjaro. The African bush on foot, the sounds and smells of nature - feeling the elements and close encounters with game is the most evocative safari experience. The Arusha National Park offers some guided leisure trails into the sub montane region with the opportunity of seeing game large and small, as well as the stunning flora of the rainforests. The walk in the Mt Meru crater leads along the impressive ash cone of the volcano and to numerous waterfalls. This fairytale land with giant trees, covered with forest beard, ferns and moss is reminiscent of “The Lord of the Rings” movie set. A visit to the Ngurdoto Crater can be combined with a rewarding walk along the crater rim. After 3 hours the highest vantage point will be reached providing spectacular views over the forest canopy and cool refreshments awaiting you. Feel the African spirit at Hatari Hemingway Camp - whilst walking the savannah plains with elephants guarded by traditional Masai morans (warriors). Calmly and slowly gliding through the still waters of the Momella Lakes is a breathtaking experience and one of the highlights Hatari offers you. Glide through pink colonies of chattering flamingos, approach grazing buffalo on the shoreline and enjoy the company of snorting hippos. Assisted by our experienced guides in comfortable canoes you discover a different world of beautiful lakes and secret bays. According to season and your wishes excursions can vary between 2 hours and a full-day trip. North of Hatari Lodge unfolds the vast unspoilt Kilimanjaro Masai Savannah. As part of the activities and experiences offered through the lodge, an exclusive visit to a Masai village allows insight into the culture and customs of this most famous African tribe. Spend time with elders, who share with you the historical background and make you sense the immense dimensions of Masai country. "Introducing you to the Masai culture" - will give you an insight into the traditional role of women, children and the young men in their society. You may watch the preparation of various digging sticks, the gathering of an extraordinary variety and number of medical plants, the preparation of traditional foods, hunting preparation, poison grub collecting, rope plant collecting, fire making etc. as well as the making of beads for their colourful jewellery. Located on the slopes of Mt Meru, Hatari offers the unique opportunity to trek the versatile sub-montane rainforest up to the crater rim and further up to the 4,566m-high summit directly from the Lodge. Two simple huts at 2500m and 3500m provide limited facilities. Equipment, food, cooking utensils and bedding have to be brought up by porters so - the trek should therefore be professionally organised. Hatari Lodge is specialised to make the trek an unforgettable experience. Hatari offers a 4-day climb combined with a 3-day stay at Hatari Lodge. Only one-hour from the Machame and Shira routes, Hatari Lodge is also a comfortable base for a Kilimanjaro climb. We can assist you in finding the most reliable sources organizing your professional climbs. Kilimanjaro Safari Camp is located at the foot of Kilimanjaro, deep in Masai land, in an area known as South Amboseli. Large East African tents, in true Hemingway style, line along a leopard hill from which magnificent views lead in all directions. At the front of the camp bush savannah melts into the slopes of Kilimanjaro, towering above into the blue skies of Africa. So close that on a moonlit night details of the glaciers can be visible. Seasonally the surrounding savannah bush teems with wildlife - large herds of elephant, eland, zebra and wildebeest and Oryx as well as Grants and Thompson Gazelle. Lion and Cheetah rub their paws! In addition this area is great for birding. From Hatari only a three-hour comfortable and scenic drive away; we take guests through our “private Serengeti” to this special bush experience as an add-on to your stay at Hatari. The seasonal Kilimanjaro Safari Camp lies within a private concession and is only offered in combination with Hatari for guests that stay a minimum of 4 nights in total. Hatari Lodge, located between Mount Kilimanjaro and Mount Meru, two of Africa’s spectacular peaks, offers the perfect base for some of the richest and most diverse birding areas in the world. Accompanied by expert birding guides, you can explore this unique habitat with the confidence that you have the best local knowledge for your ‘dream’ ornithological safari. With a list in excess of 650 species, this area is a treat for serious birders. The park’s greatest attractions are its spectacular landscapes and its rich flora. Although the surrounding countryside is rather dry, the park itself is green throughout the year, and offers three different and impressive natural habitats. Waterfalls and lakes, steep cliffs and gorges, swamps and waterholes, all provide great opportunities to encounter wildlife. 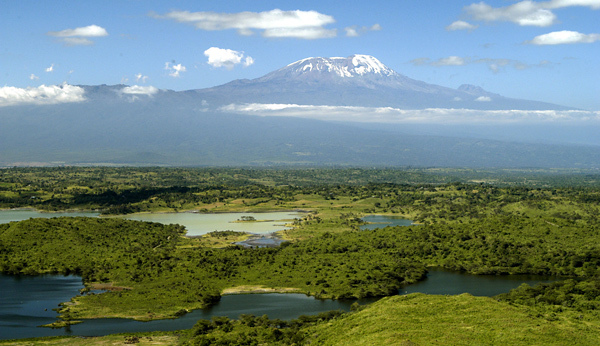 In the north-eastern section of Arusha National Park lies the area known as the Momela Lakes. Fringed by green hills seven lakes nestle in valleys and depressions punctuating the post-volcanic landscape. Their sodium rich contents and the formation of algae make the lakes alkaline, especially Big Momela Lake and Lake Reshateni - and therefore year round favourable feeding and resting areas for flamingos. Just next to Big Momela nestles the elongated form of Little Momela Lake in a valley of green, dotted with islands and secretive bays, where buffalo, water and bushbuck, hippos and a variety of waterfowl are seen. To the north of the two Momella Lakes, tucked away in valleys of their own, are the little and rarely visited lakes Lekandiro and Tulusia which are Ideal places to relax under the shady trees. Lake Kusare, small and swampy during the big rains is a favourite spot for waterbuck. Lake El Kekhotoito surrounded by green hills dries up in the autumn months to become a pan with little streams, attracting plenty of buffalo, giraffe, zebra and smaller forest antelope. The most intense and dramatic way of exploring all this diversity is on a canoeing safari. The Hippo-Pool can be visited by a short walk from Hatari Lodge. The Ngurdoto Crater is nicknamed the “little Ngorongoro Crater“, alluding to its forgotten beauty. Like a jewel in a crown it is a protected area within a protected area. Its fragile but diverse ecosystem cannot be visited by car or on foot. Only from its crater rim, reached by a steep car track through mountain rainforest, with its various beautifully situated viewpoints may the visitor enjoy this “sunken” Noah’s Ark in its primeval jungle, secluded in the south-eastern corner of the park. The crater floor, some 300 feet below and measuring about 1,5 miles across is home to interesting fauna and flora. Like the Ngorongoro Crater Ngurdoto is actually a caldera, a collapsed volcano probably measuring 10.000 feet before its last eruption. Today the highest point reaches just over 5.000 feet. Highlights along the crater rim are the numerous colonies of monkeys, regularly seen in the trees along the car track, which leads about half way around the crater. The rest of the crater rim and the sight of the cliffs along the inner crater can be enjoyed on foot guided by our expert rangers. Hatari Lodge offers excursions to Ngurdoto Crater. The driving time from the lodge is about an hour. At 4,566 metres high, Mount Meru ranks as Tanzania’s second highest, and as Africa’s fourth highest mountain. During the colder months and with high altitude rains its peak can be covered by snow. Its steep mountain rim serves as the western border of the park. When viewed from the south, Mount Meru shows the typical cone shape of a volcano. However, when seen from the east, it offers a completely different sight! The collapsed eastern mountainside, and the remains of eruptions within the crater, bears witness to the intense volcanic activities which shaped the mountain so many years ago as a part of the eastern Great Rift Valley. Apart from a few fumaroles emitting hot steam, today’s Mt Meru is a dormant volcano with impressive and unique scenery for both nature lovers and mountain climbers. The mystery of the mountain is in the fairytale setting of giant trees with “legs” and “hair” like witches, whispering streams and waterfalls - the lush green dotted with jewels of hidden flowers and hovering butterflies. Hatari Lodge offers 4 day Mt Meru climbs, which can easily be combined with any safari. The history of Mount Meru is ancient. Momella has been part of it for the last 100 years. In 1906 Margarete Trappe arrived on an ox wagon from the coast. Her courage and pioneering spirit set the tone when they travelled the picturesque Meru-Pass, at which her new home - Momella - was situated. A big farm was created and built by the Trappe family where they kept cattle, horses and goats and enjoyed the surroundings and the abundant wildlife. The start of the First World War brought a cat-and-mouse game between Margarete Trappe and the English soldiers and earned her the nickname Iron Lady for her stubbornness, strength and courage as she scouted for Von Lettow Vorbeck in his “Ice Cream War” with Frederick Courtney Selous. However fate was not kind to Margarete. Disowned and bankrupt she returned to Meru and started rebuilding a new farm called Ngongongare or Yejo’s - her Maasai name. Financial survival was however finally secured by highly profitable trophy hunting after she became the first female professional hunter in East Africa. Fittingly her last tribute was from her beloved elephant herd as they gathered around her house in 1957 when she passed away. Margarete’s son Rolf leased the property to Paramount Pictures as the setting for the classic movie “Hatari”, starring John Wayne. Hardy Krüger bought the property in 1960. He wanted a farm in Africa – a dream came true, for 13 years! Hardy Krüger’s former home was transformed much later into the small and privately managed Ol Donyo Orok Lodge, which closed in 2002. Today this house is part of Hatari Lodge, and is inhabited by the Gabriel family. Jim Mallory’s former house is now the main building of Hatari Lodge. The name was chosen in memory of the classic Hollywood movie “Hatari”, parts of which were filmed in the immediate surrounding areas.  Hatari Lodge is open all year.  Hatari Lodge is approximately one hour by road from Arusha International Airport.